In thousands of music learning systems across the country, group instruction has proven to be an exceptionally practical and productive method for teaching music. 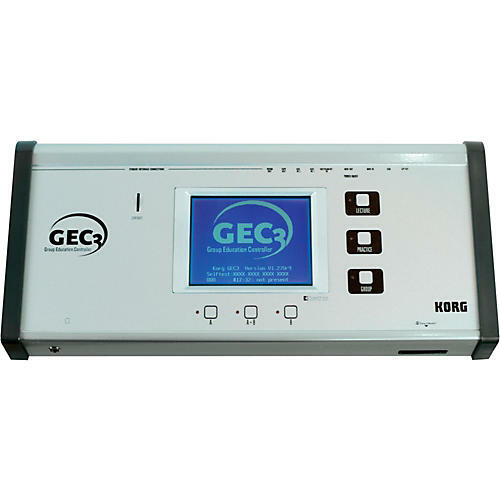 The Korg Group Education Controller III (GEC3), is at the heart of the group music learning system. Based on Korg's extensive work with teachers over the last 10 years, the Korg GEC3 has evolved into a stereo, fully-digital, flexible and cost-effective audio routing system. Its performance is unmatched by any other available group learning system. Suitable for any teaching level and any combination of electronic instruments, (MIDI keyboards, guitars, sound modules, computer soundcards, etc.) the GEC3 allows teachers to interact with as many as 16 different student stations and up to 32 students, since each student station can accommodate two students. Lecture Mode: This mode is used to present material in a lecture format. All students hear the teachers microphone and instrument as well as their own instruments. Practice Mode: This mode is used if the students are working independently. Each student hears only his or her own instrument. The teacher has the option of œeavesdropping on the student and initiating 2 way communication with the student. Group Mode: This mode is used when students are working together in groups(two or more student workstations in any conceivable order). Each student in a group can hear his or her own instrument as well as the instruments/microphone of the other members of their group.